Is the Federal Reserve Gonna Cause a Rise in Gold Prices? The Federal Reserve has just made a very strong case for owning gold. It wouldn’t be shocking to see gold prices surging in the coming months. You see, over the past few years, the Fed has been adamant that it will continue to raise rates, which put pressure on gold. The narrative was that gold is a useless asset in times of rising interest rates. Investors followed through and ditched the precious metal. Put simply, the Fed is pretty much saying it’s slightly concerned about what’s happening, and may not be raising rates going forward. The Federal Reserve was very aggressive in raising rates and made it very clear that it would not stop no matter what. Recall how President Donald Trump was telling the Fed that it’s doing a bad job and shouldn’t raise rates, and the board didn’t listen? This is very big news—and very bullish for gold bugs. Here’s the kicker: as the Federal Reserve has hinted it won’t raise rates, there’s already a lot of talk about how rate cuts could be on the table down the road. However, that would be getting ahead of ourselves. What Should Gold Bugs Know Going Forward? Don’t be shocked if those who ditched gold between 2013 and 2015 suddenly rethink their decision and start buying. 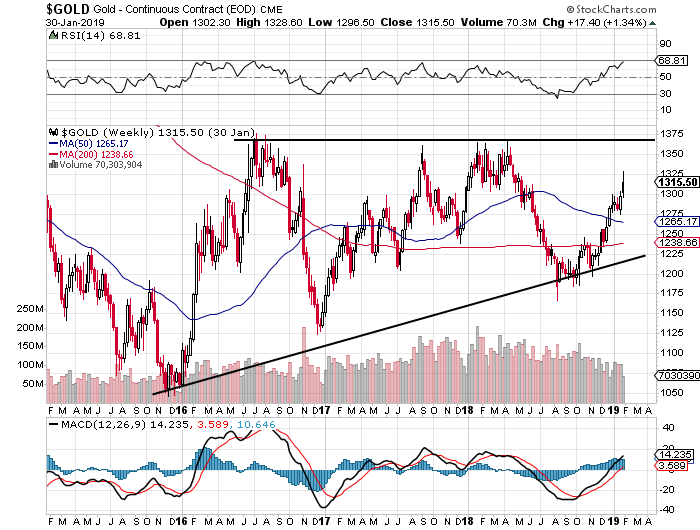 This could cause gold prices to move higher. However, if you are looking for leveraged returns, it would be wise to pay close attention to gold mining stocks. They tend to outperform performance on gold bullion by a large margin. Over the past few years, gold mining stocks have been heavily scrutinized by investors. Should we see a bull run in gold prices, it wouldn’t be surprising to see them do much better than they did in the previous bull market. Over the past few years, we have seen a formation of a technical analysis pattern called an ascending triangle on the gold price chart (above). This pattern develops when there’s an uptrend but the price finds it difficult to pass beyond a resistance level. For gold, this resistance level has been around $1,355 to $1,375. Note that price starts to escalate once the resistance level is broken. As it stands, we are seeing bullish momentum. Indicators like the moving average convergence/divergence (MACD), plotted on the chart above, say buyers are present, purchasing, and could take gold prices much higher—that is, assuming the price breaks above resistance. To predict where gold prices could go next, technical analysts usually measure the widest part of the triangle and add its length above the breakout level. In this case, the widest part of the triangle is the price action between December 2015 and July 2016 at about $300.00. Adding that to the breakout level of $1,375, we could see gold prices as high as $1,675. Time will obviously tell. However, I remain bullish and believe it would be foolish not to look at gold as the Fed mulls over rate increases.